On February 24th, 2015 the Laguna San Ignacio Ecosystem Science Program (LSIESP) sponsored it’s Annual Community “Reunion” at the Kuyimita Eco-Tourism Campground palapa on the south shore of Laguna San Ignacio. 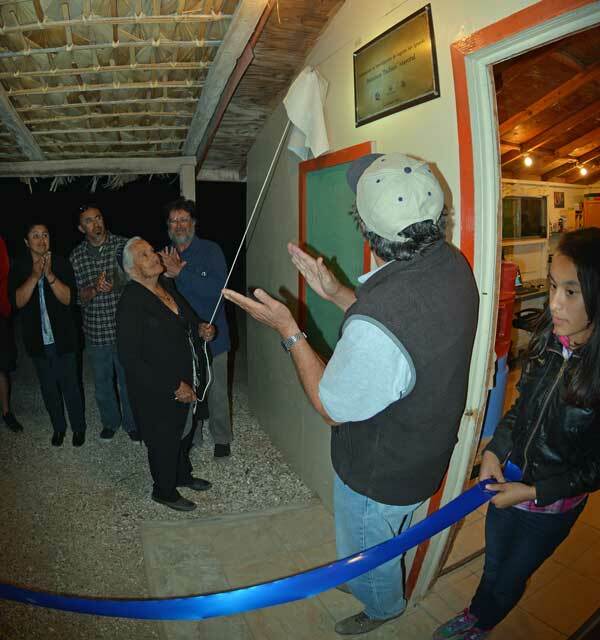 This year’s Reunion included the dedication of the LSIESP field laboratory to lagoon resident Francisco “Pachico” Mayoral who passed away on October 22, 2013. “Pachico” was an ambassidor for the gray whales and for Laguna San Ignacio. He is credited for being the first person to experience and to touch a “friendly” gray whale while fishing in Laguna San Ignacio in 1973. This marked the beginning of the “friendly whale phenomenon” where today free-ranging gray whales and their calves approach pangas full of whale-watchers, sometimes allowing the humans to stroke and pet them. In the 1990′s Pachico played a major role in informing lagoon residents and concerned conservation organizations of plans to build an industrial salt production facility at Laguna San Ignacio, a project that was finally vetoed by then President Zedillo because “…the salt facility was not consistent with the mission of the Biosphere Reserve…” of which the lagoon is a part. Pachico was always interested in learning what the scientists and researchers were discovering about the lagoon and the whales, and he encouraged investigations any way he could. Whether he was assisting scientists, conservationists, or his sons to continue the family whale-watching eco-tourism business, Pachico’s insights into the lagoon, its wildlife, and the need to protect the lagoon were an inspiration to all. In attendance at the Reunion were the Mayoral family, LSIESP researchers, representatives of the eco-tourism companies that work at the lagoon, visitors and guests. The dedication of the laboratory followed a presentation on the number of whales that were visiting the lagoon in 2015 by LSIESP Co-Director Steven Swartz, and a second presentation by Sergio Martinez on the findings of the LSIESP’s ten years of research on gray whales in the lagoon. Rememberances of “Pachico” were presented by Josele de Jesus Varela G. of Kuyima Eco-Turismo, LSIESP’s Steven Swartz, and “Pahcico’s” eldest son Pancho Mayoral. Afterword, the Mayoral family and guests walked to the field laboratory where Senora Carmine Mayoral unveiled a plaque stating the laboratory’s new name“Laboratorio de Investigción de Laguna San Ignacio Francisco ‘Pachico’ Mayoral, 24 febrero 2015.” She then cut a blue ribbon to officially open the laboratory to the family and visitors. Inside LSIESP researchers explained the various activities and analyses that are conducted in the laboratory, and answered questions about the exhibits and displays. The Mayoral family and guests returned to the Kuyimita palapa for snacks, refreshments, and a chance to exchange stories about their friend. The LSIESP field laboratory first opened in the winter of 2006, and since that time it has become a center for investigations on the biological status of the lagoon and its wildlife, and a community center for information and education about the gray whales and the lagoon they inhabit each winter.